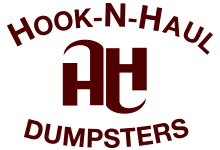 Whether you’re selling your home, moving, renovating or just need junk removal Austin, Hook-N-Haul Dumpsters will help make the process as easy and as painless as possible! With Hook-N-Haul Dumpsters you don’t even need to bring any items to the curb. All you have to do is point to the items you want removed and I will lift, load and haul them away. I will even broom sweep any mess caused by the removal. My residential trash and debris removal service can and will take care of all your trash removal Austin problems! Whether you have a few unwanted items or you need an entire office cleaned out, no commercial job is too big or too small for me to manage. My Austin customers have come to rely on Hook-N-Haul Dumpsters for all their junk removal Austin, and trash removal Austin needs. You can call me 7 days a week to schedule an appointment. I will provide you with a free, no-hassle on-site estimate. My pricing is always upfront with no surprises or hidden charges. Until you agree to a price, you are under no obligation. This is especially true if the junk is heavy, smelly and has sharp edges! You probably will get a great workout, but if you’re not used to physical labor of this type you may find the task a bit daunting. At least you will create more income for your massage therapist and chiropractor. Creating more jobs these days is a great benefit to society! The most obvious rental that you might need is that of a truck to haul away your junk. Truck rentals of this type can add up, and then of course there is the fee at the dump itself. This trip to the dump could be a great way to spend some quality time with your family though if they agree to help you out. Kids often love to throw objects into that big smelly pit at the dump. If you’re planning a family picnic though it might be best to eat your food before entering the dump facility. Often times the accumulation of junk in our yards or parking lots can be a slow and gradual process. We have become accustomed to the mess that is created so that we no longer even notice it. But you can be sure your neighbors will. So do yourself and your neighbors a favor and have that junk hauled away today at my very affordable rates. This is extremely important when you are trying to sell your home. But is also important to your neighbors when they are trying to sell their homes. One junk challenged home on the block can devalue everyone’s home values. Not the best reputation to have in your neighborhood. It’s true that all animals need a place to call home, and many of us do love our pets. However, unless you are looking to fill that emotional void that only a pet can fill with animals like rats or other similar types, it might be time to consider having that junk removed from your yard and or from inside your home. While pet stores do sell rats as pets, the wild variety that may be living in your yard or home can carry many types of diseases. If your yard is filled with junk you might find yourself being excluded from most of the block parties. At least you will give the other neighbors something to talk about. Gossip is a favorite pastime between people and you will be aiding in their quest to find something to gossip about. But if you decide you really do enjoy the occasional block party then maybe it’s time to call Junk Removal of Austin. If you work from home or your junk problem is located on commercial property you could very well cost yourself lots of income with lost customers. The outside and inside of your office tells your customers a lot about what kind of person you are and can negatively affect their perception of you and the service you provide. Not all junk is created equal, and not all junk can legally be disposed of in the same way. There are certain rules that should be followed when disposing of your junk. But why would you want to even deal with this issue when you can have this problem solved quickly, easily and very affordably without even needing to lift a finger. Often times the junk pile has been building up for quite awhile right? It’s possible you forgot about those toxic chemicals you used last year on some project that you just stuck in the pile. Maybe you hired workers to do work on your home and they piled in the excess fiberglass insulation. There a many ways to dispose of various materials that can greatly benefit the environment. This type of sorting is second nature to someone who removes junk on a regular basis. There are different organization that are set up to receive different types of items. By allowing a professional to remove your unwanted junk you are also doing your community a favor.